Until fairly recently washing was a difficult and physically demanding job. In the Medieval and Tudor periods outer garments belonging to the wealthy could not be successfully cleaned, only brushed and aired for freshness. The fine fabrics; silks, brocades and velvets, would not stand up to the harsh alkaline soaps available. As changing fashions demanded slashed, embroidered and padded garments which were sometimes stuffed with bran or card these were worn until they were either too unsavoury or too unfashionable. They were then discarded after anything reusable like trims had been removed and they then entered an active second hand clothes market. At a time when every item of clothing was hand made from beginning to end clothing was a valuable commodity and the poor had few scruples about stripping bodies or stealing clothes let alone buying used clothing. The fabric used next to the skin was usually linen. This was because it could resist the tough washing process in the days before deodorants and actually washes progressively whiter and softer with use. In order to loosen grease and dirt the clothes were first bucked. This involved soaking them in tubs of lye, a harsh alkaline made from water which had been trickled through wood ash. Sometimes the clothes were layered on sticks and supports inside the buck tub and the buck was patiently poured through them a number of times. (This is one possible origin of the saying ‘passing the buck’)The next process was the actual washing to remove the lye. Clothes were taken to the nearest stream or river and either batted with wooden poles or trodden – a process still done in some parts of the world. The alternative method was heaving them up and down in changes of water in a tub. Soap might be used to remove stubborn marks. Stale human urine which had ammoniated was used as a bleaching agent. This helped linen to gradually acquire its pristine whiteness. After soaking the whole washing process took place to remove any traces of the urine. 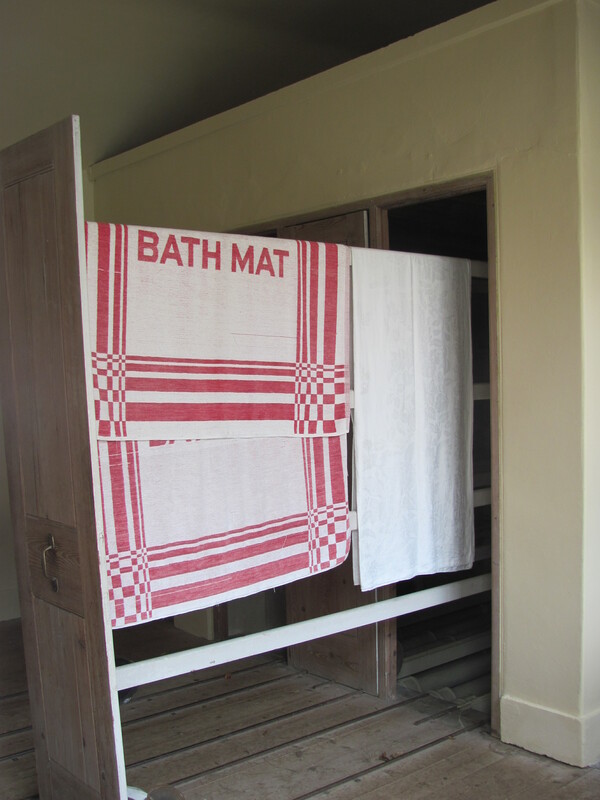 Until the seventeenth century, the great houses saved their washing and had what was known as a ‘Grete Wash’. Curiously, given the difficulty and time involved in getting things dry, the best time for this was winter. Clothes were hung out overnight in the moonlight and frost as part of the cleansing process. Although it sounds like an old wife’s tale, doing this helped to break up dirt and grease and does actually work, though it is important not to ‘break’ the fabric whilst it’s frozen as this snaps the fibres and damages the garment. Some soap was made at home or by itinerant soap makers. It involved boiling animal fat, most usually mutton, in vats of lye. When the mixture had reduced and started to clump and harden it was either shaped by hand or poured into wetted moulds to dry and harden properly. Sometimes scents were added if the mixture was for personal use, but spices such as cinnamon and clove were as popular as floral perfumes. In 1524 it was recorded as costing 1d per pound and soap makers could be fined for selling their soap ‘too wet’ so that it weighed more. For personal use, wealthier people purchased imported soap from France and Spain which was made with olive oil rather than animal fat before being scented with plant oils like rose or lavender. Country folk are known to have boiled up saponaria or soapwort to give a frothy cleansing lather. Clothes then had to be dried. Although there is evidence of line drying by the late 17th century, before then clothes were spread on bushes or out in communal drying fields, like Moorfields or Spitalfields in London. The court records for Southampton in the 1570s show a man sentenced to have his hands chopped off for stealing clothes from the communal fields and theft seems to have been a fairly common problem. Clothes pegs were not invented until late in the 18th century. Originally mangles such as the big box mangles which were weighted with stones were devices designed to smooth out fabrics after laundering. It was not until the Industrial Revolution was well underway that the principle of mangling was applied to wringing as a means of extracting water successfully. Examples of the heavy iron framed mangles with their huge wooden rollers are still fairly common. As these were so heavy to move around they were generally kept outside in the yard behind houses or in an outhouse (unless one had a house large enough to include a purpose built laundry area – usually separate from the house because of the damp and steam the work involved). These were still often in regular use up to the Second World War as they are generally indestructible except through rust. 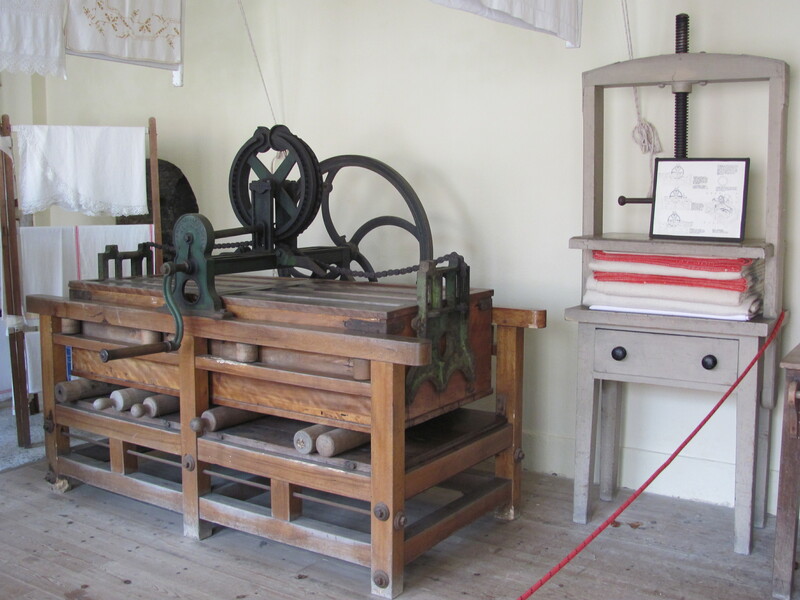 When garments were ready to be put through the wringer (mangle) they were generally wrapped first in a piece of unbleached linen or Holland cloth as this prevented the garment getting stained with wood marks from the wet rollers. Personal garments or ‘smallclothes’ did not have fancy buttons on them. They were secured either by tapes or had washer buttons on them which were flat metal discs covered with linen. These passed through the wooden rollers without getting damaged. One of the ways in which it is often possible to tell whether an old garment has been updated is to check to see if it has been given fancy pearl buttons as these would not have survived a single trip through the laundry. Irons were a Victorian industrial invention. Many homes could afford at least two or three: one in use and one or more heating in front of the fire. There was an astonishing variety of sizes available, ranging from heavy goose irons weighing perhaps 5 or 6 pounds (nearly 3 kilos) down to tiny ones designed for delicate lace and baby clothes. These ones, perhaps only three or four inches long can be confused with toy ones. There are also the curious boat shaped irons with a point at each end which were designed and patented by Mrs Amelia Potts, and irons which had containers for hot charcoal or a metal ‘slug’ which was heated separately and then inserted into the case. Large homes with their separate laundry rooms often had a purpose built stove with racks set all round it to hold a complete battery of irons. Goffering irons or tongs, a bit like modern heated hair curlers, were also widely used and needed heating before a fire before use. Once the wash was complete, most clothes were traditionally kept in a press if the owner could afford one, or were back on the owner as soon as they were dry. Back in the Middle Ages clothes were hung in or near garderobes as the smells were thought to deter moths. By the eighteenth and nineteenth centuries clothes were laid away in drawers with bags of scented herbs to keep them fresh. Interestingly, the tiny circular holes often found on preserved baby clothes were usually caused not by moths but by the acidity in lavender oil as parents lovingly sprinkled the flower heads amongst the clothes as they put them away to store. One advantage of using wringers carefully in the nineteenth century was that the pressure of the rollers also helped to eliminate the need for lots of ironing. Laundry maids would fold tablecloths, napkins and huckaback towels so that the wringer effectively pressurised them into neat folds. During the nineteenth century and into the Edwardian period the enormous tables of great houses would be covered in snowy napery, but this would typically be covered in a neat criss cross of square fold marks. Smooth tablecloths had yet to appear.